Pre-clipped hair extensions. Hassle free, clip and go. Clip in Hair set of 5 OR 10pcs. Adds volume to your hair and easy to install. Divine Collection Syn Hair Extension Clip In is made up of 100 percent synthetic future hair. It is safe to use curling iron, flat iron, blow dry and restyle. 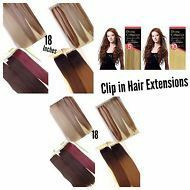 Clip in Hair set of 8pcs. Adds volume to your hair and easy to install. Custom colour available!